For seven weeks, the some 400,000 people of Misrata city (there are nearly 600,000 in the province of that name) were subjected by Qaddafi brigades to tank fire, to artillery fire, to mortar fire, and to sniper fire, in a vicious, indiscriminate manner that constituted serial crimes against humanity. Hundreds have been killed, some say over a thousand, and wounded are probably three times fatalities. On April 7, Qaddafi’s forces made a drive into the downtown area, taking it from the city’s defenders and pushing them to the port area as their last bastion of hope. For now, the brave fighters of Free Libya have rallied to push the Qaddafi brigades out of their city, taking the tall buildings along Tripoli Street downtown away from the snipers, one by one. UNSC-authorized NATO attacks on Qaddafi’s tanks and GRAD missile launchers (and more recently a US drone strike on such a rocket emplacement) gradually sapped the strength from the brutal attackers even as aid ships brought desperately needed food and supplies to the Free Libya forces. I call them “Free Libya forces” because that is what they call themselves, on Benghazi radio. The Benghazi Transitional National Council has been recognized as the legitimate government of Libya by France, Italy and Qatar, with more governments near to taking this step. They are not mere ‘rebels’ any more. They control major urban centers– Tobruk, Dirna, Baida, Benghazi, Misrata and Zintan as well as some of the rural areas– probably in all the population supporting the TNC is at least half the country. If we count populations laboring unwillingly under Qaddafi’s rule, it is a clear majority. 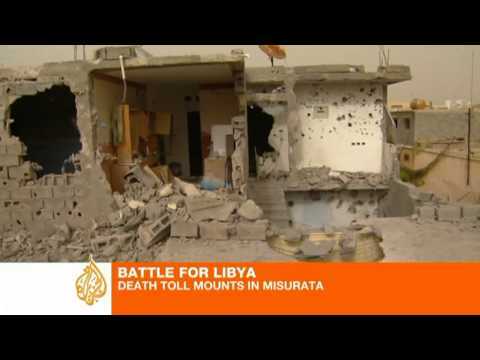 Agence France Press reports that the Qaddafi brigades have been forced to withdraw to the western suburbs of Misrata. On Monday they retained the ability to rain mortar shells onto the city in their wonted indiscriminate way, killing nearly a dozen people. But for the moment, the city has been reprieved from its death sentence. People are no longer pinned down, afraid of the snipers. For the moment the danger has receded, of the city being simply crushed under Qaddafi’s jackboot. Captured loyalists and mercenaries revealed to AFP that morale is extremely low among the Qaddafi brigades at Misrata, and that they might have surrendered some time ago if they had not been afraid of being summarily executed by the Free Libya forces in the city. The Free Libya commanders need to do a better job of advertising, and demonstrating, that they will treat surrendering soldiers decently. Aljazeera Arabic reports ominous rumors that one of Qaddafi’s sons, Saadi, is preparing to lead a brigade loyal to him against Misrata, reopening the front against the largest Western city to still resist Qaddafi’s sinister embrace. Qaddafi’s hold on the west is precarious. His forces are being actively fought by the Berbers of the Western Mountain region, centered at Zintan. There is reportedly a strong underground resistance against him in Zawiya, which his tanks crushed in March in what was almost certainly a massacre. On Monday, the youth of the Duraibi quarter of Tripoli defied the dictator by releasing flocks of doves to signal their support of the Free Libya government based in Benghazi, according to Facebook and Twitter announcements. It is to be hoped that the doves, a symbol of peace, are harbingers of things to come in Libya. In the meantime, we must be grateful for small, provisional victories by Free Libya against the dictator, and Misrata’s liberation surely counts as a major such moment. And, it is a vindication of the UNSC decision to call for outside intervention. Without that step, Misrata by now would have been crushed, and the Free Libya leaders and known supporters would be being dragged off to dark places for torture and summary execution.